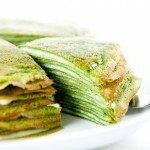 I blogged about pea pancakes in the past but this is a different recipe that I like even better. These little green giants are really delicious. You can top them with smoked salmon and sunny side-up eggs and you’ll have a fine brunch dish, a miniature version with quail egg makes an impressive amuse-bouche, or simply leave them naked for a healthy snack. And when I said that for a few weeks in the spring all my food turns green, you thought that I was kidding, eh? The other reason I’m blogging about this is because I bought a pack of 12 quail eggs that I’m desperately and shamelessly trying to unload. I hate to waste food! 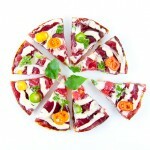 You saw them on the spring pizza, they show up again today… and you might meet again! If I get desperate enough I might make the smallest omelette in the world and be done with them. Who wants to eat the smallest omelette, ever? What makes these so good is that part of the pea batter is pureed while the rest of the peas are incorporated into it which gives them great textural contrast. 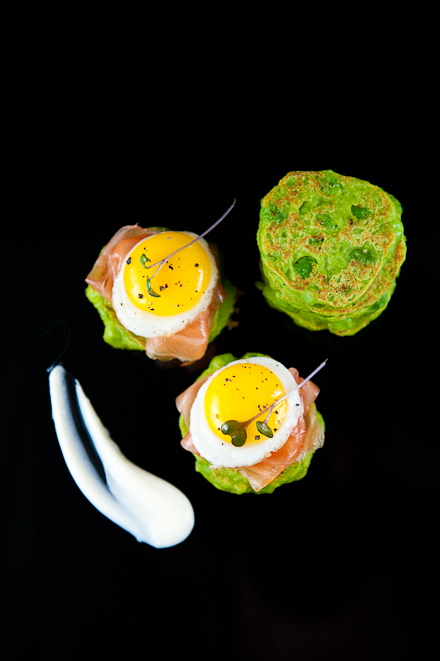 Of course the Scotch smoked salmon on top doesn’t hurt and plays nice against the natural sweetness of the peas, and together with the creamy yolk and crème fraiche it makes a very luxurious bite. And if you happen to have caviar hanging around your refrigerator… well use it here. Or give it to me. I beg you. Bring a small pot of water to a boil and blanch them until tender, about 1 or 2 minutes. Drain, then run under cold running water until cold. Set 1/3 of the peas aside and puree the remaining pea in a food processor with the egg. The mixture should be smooth, if not add one or two tablespoons of water. Place the puree in a bowl and whisk in the flour, salt and pepper and the reserved whole peas. The mixture should have the consistency of pancake batter, adjust the amount of flour accordingly. Place 1 tablespoon of oil in a skillet and heat over medium-high heat and spoon the batter with a spoon to make pancakes. Don’t crowd the pan too much. Cook gently, about 3 minutes per side, taking care not to color them too much. Place the pea pancakes on a plate and keep warm while you cook the rest of the batter. Keep the skillet on medium heat and add a little more oil. 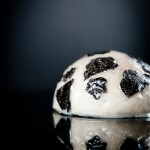 Break the quail eggs or hen eggs in a ramequin taking care not to break the yolk and transfer to the skillet. Season with salt and pepper and cook to sunny-side up. You can use a small pastry cutter to trim the eggs into perfect rounds or ovals. 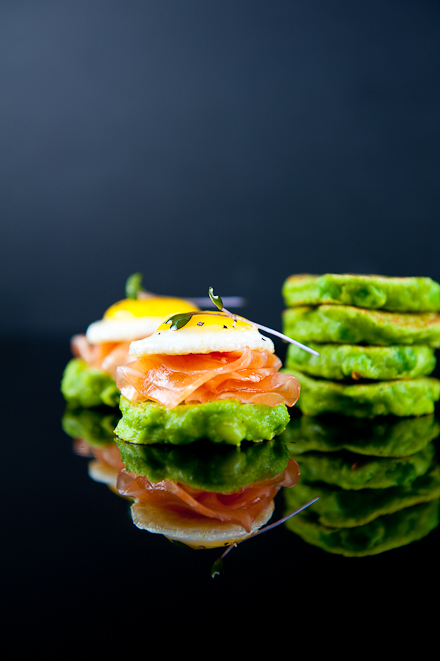 Top the warm pea pancakes with smoked salmon. Squeeze some lemon juice over them and top each pancake with an egg. Serve immediately with crème fraiche. oh good lord!!! the colors alone look amazing. I can imagine how delicious this would be! How do you figure out calories for these? Those are brilliant pancakes. Delightful colors, and beautiful photography. Breakfast like this would make any day delicious and happy. 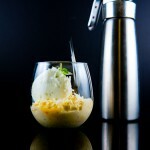 Inspiring pictures and recipe as usual! I would want to try the smallest omelette in the world! Really loved this recipe. I will make it soon, thanks for sharing. I had made your other pea pancake recipe several times and loved it so if this one’s even better, then it’s definitely going in my must-try recipe folder. I love, love, love those colours! So springy! 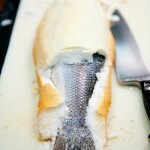 I don’t have caviar hanging around, but I do have everything else, including the smoked salmon. Will make these for mother’s day brunch! I do have the “HEN” eggs too! I really like these as an amuse-bouche. And I’d love to see the world’s smallest omelet! It be fun to see the worlds smallest Eggs Benedict, too. Your top 2 photos are great (but you knew that!). I like the way how you’ve recently been lighting the background on the black acrylic shots. And I’m always a sucker for well-composed overhead shots. Good post. And a particularly good recipe. 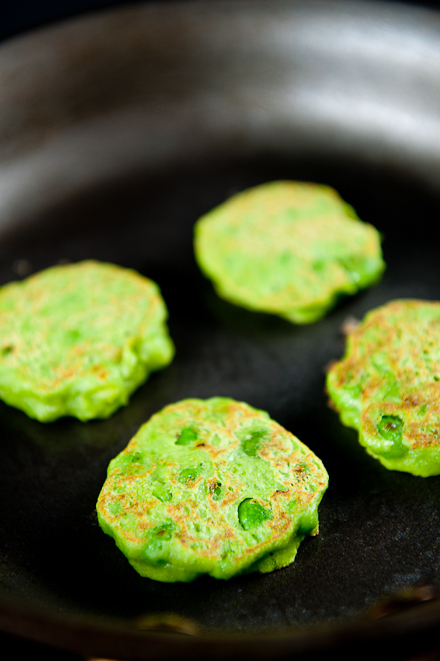 I’ve not made pea pancakes, and they’re so fun and easy – I’m putting this one on my bucket list. Thanks. Oh yeah, I remember these show-stopping pancakes. I made them and loved them. The green of the pancakes is so beautiful, they put a plain old blini to shame. Beautiful and sounds luscious, will make these soon. Thanks for the inspiration all the time. 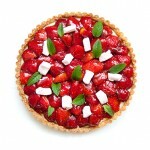 What a GORGEOUS recipe, redolent with the flavors of springtime. Love these colors! Just beautiful. And, now I’m really wishing I could find quail eggs here. What gorgeous photography! 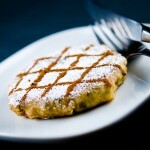 Your pea pancakes look delicious! I just found your incredible blog – where have I been all these years. I can’t wait to try some of your recipes. Thank you so much for sharing your delectable recipes. Beautiful! 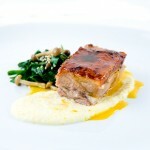 This is a beautiful looking dish. swear to god i make something like this (but way less gorgeous) for my 19 month old son. Well, the pea pancake. i’ve learned to make blini/pancake like things out of virtually everything since sometimes it’s the easiest way for a kid who can’t use a knife and fork yet to get his veggies. lentil pancakes were a even a hit! maybe he can have this gourmet version one day. Really really pretty pancake. I love it, bookmark it! Thanks Amy! Oh I love the idea of a lentil pancake. I put that on my to do list. Your son is going to grow up to be a “fine gueule”. Where have you been all these years!? Welcome! It couldn’t be any simpler. haha.. I almost spit out my coffee when I read that. Say hi to HENry for me. 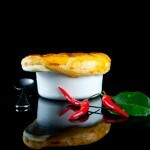 very creative, i love the presentation.. i will definitely try this dish..
art in food! love it. these look so good! Gorgeous. I am definately making these! Brilliant, gorgeous and so manageable. I’m going to surprise my family this w/end! I just love your website and check it daily to see if you have a new post. I loved this recipe and attempted it today. It didn’t look as amazing as yours but it tasted divine. The only change I made was I missed some mustard with the creme fraiche instead of lemon. I had these in a German Restaurant in San Francisco. They were served with a dab of sour creme. So very yummy! These are SO easy to make and they look just like the picture. I made them as an appetizer for a baby shower topped with smoked salmon-avocado mousse. They’re awesome; great pea flavor and a nice texture with the whole peas! These pancakes are so wonderful, they’ve become an Easter tradition at my house. Thank you!